« 1933 yearbook ads: Who is still in business? In the 1920 and 1930s, Village streets were lined with eclectic bars and tea houses. One establishment that apparently combined the two was the Jumble Shop at 28 West Eighth Street. 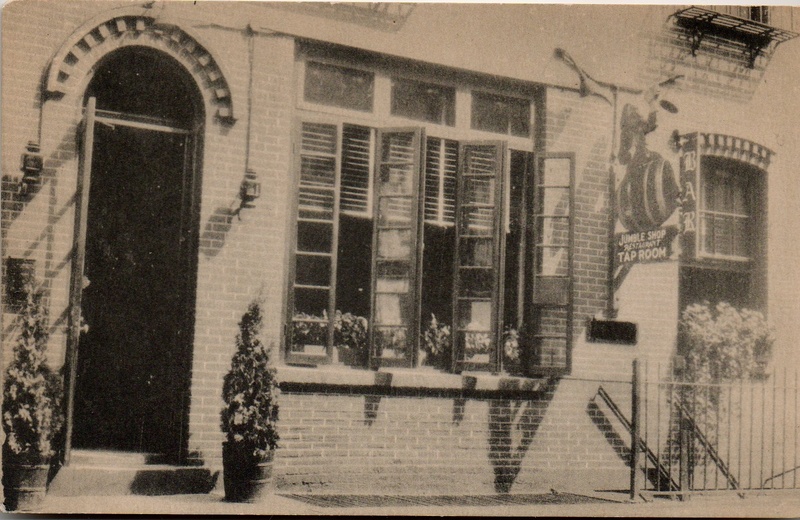 The sign in this undated postcard says it’s a restaurant and bar. The Jumble Shop is sometimes credited as a speakeasy, it seemed to start out as an antiques shop serving tea and crumpets on the side. “This is my last night in New York for two months. I go down to Greenwich Village with my friends. Near Washington Square they show me a charming cafe, the Jumble Shop, which looks almost European with its red tiled floor and its quiet little tables arrayed along the walls. You can eat and drink there all night. This entry was posted on January 20, 2009 at 5:32 am and is filed under Bars and restaurants, Poets and writers, West Village. You can follow any responses to this entry through the RSS 2.0 feed. You can leave a response, or trackback from your own site. Great post, very interesting. I don’t think New York could ever be a cafe society because the natives don’t and/or can’t sit down long enough for that to every happen. New Yorker’s have too much adrenalin to wile away hours enjoying tea or coffee as the world goes by. We are a different breed all together. The Jumble Shop was also an art gallery. The New York Times wrote about it in 1932. Jewell, Edward Allen, Art in Review: Youthful Explorers in Form and Color Present Deep Problems for Lay Spectators- Art in a Gastronomic Setting, 1932, New York Times (1932, May 7). The history, incidentally, shows that an impressive mix of people were patrons the Jumble Shop, including the Lincoln Memorial sculptor Daniel Chester French, gourmand, photographer and railroad historian Lucius Beebe, Thomas Wolfe, Theodore Dreiser, Martha Graham, Lily Pons, and Sherwood Anderson.